Hypoglossal nerve is the 12th cranial nerve and originates from the medulla oblongata. It’s a motor nerve. Hypoglossal nerve is a motor nerve which, like the vagus and glossopharyngeal, is involved in the movement of tongue muscles, swallowing and speech. It innervates all the muscles of the tongue except palatoglossus muscle which is innervated by the vagus nerve. General somatic efferent fibres: These fibres supply all the muscles of the tongue (extrinsic and intrinsic) which grow from occipital myotomes and originate from the hypoglossal nucleus. The hypoglossal nerve originates between the pyramid and the olive by ten to fifteen rootlets, on the ventral part of the medulla from the anterolateral sulcus. The rootlets of the hypoglossal nerve run laterally and pass behind the vertebral artery to create 2 roots. The two roots pierce the dura mater individually near the anterior condylar (hypoglossal canal) where they go inside. In the canal, both roots unify to create one trunk and come out of the cranial cavity. The rootlets of the hypoglossal nerve are connected in accordance with the rootlets of the ventral root of the 1st cervical spinal nerve. After coming out of the cranial cavity, the nerve is located deep to the internal carotid artery and the 9th and 10th cranial nerves. It then enters downward and laterally behind the internal carotid artery and the 9th and 10th cranial nerves to reach the separation between the internal jugular vein and the internal carotid artery. After that it descends vertically in this period in front of the 10th nerve up to the level of the angle of the mandible. Here the nerve curves forwards crossing in front of the internal and external carotid arteries and the loop of the first part of the lingual artery to get to the posterior margin of the hypoglossal muscle by passing deep to the tendon of the posterior belly of the digastric. Now it runs on the superficial surface of the hypoglossus, muscle below the deep part of the submandibular gland. At the anterior margin of the hyoglossus it is located on the genioglossus and runs forward and upward up to the tip of the tongue and ends by breaking up into its terminal branches which supply the muscles of the tongue. Some fibres of the 1st cervical nerve (ventral ramus) join the hypoglossal nerve and are spread via its branches. They supply all the muscles of the tongue with the exception of palatoglossus that is supplied by the cranial root of accessory through the pharyngeal plexus. Meningeal branch: It originates from the nerve as it comes out via the hypoglossal canal taking a recurrent course, enters the cranial cavity via thehypoglossal canal and supplies the dura mater of the posterior cranial fossa. 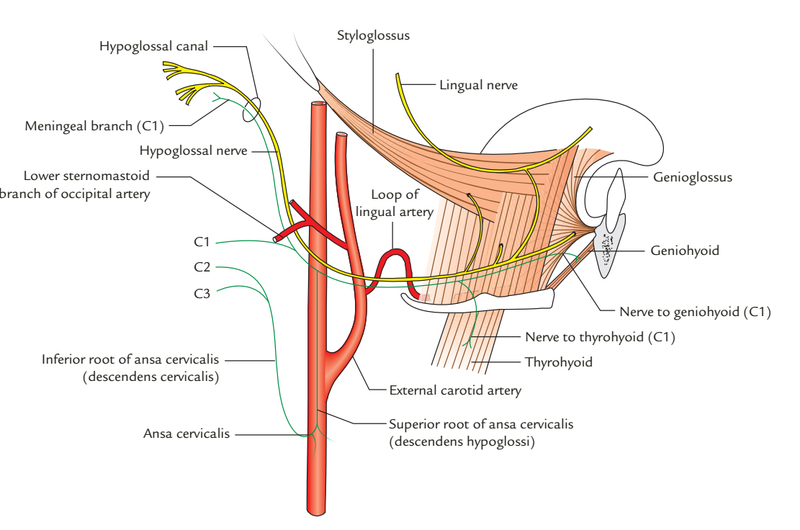 Descendens hypoglossi or upper root of ansa cervicalis: It originates as the nerve crosses in front of the internal carotid artery. It runs downward to join the inferior root of ansa cervicalis at the level of cricoid cartilage. Nerve to thyrohyoid: It crosses the greater cornu of the hyoid bone to make it to the muscle. Nerve to geniohyoid: It originates from above the hyoid bone. To check the integrity of the hypoglossal nerve, the functions of genioglossus muscles are evaluated. The patient is requested to protrude the tongue. If the hypoglossal nerves of both sides are complete, the protruded tongue is located in the midline. 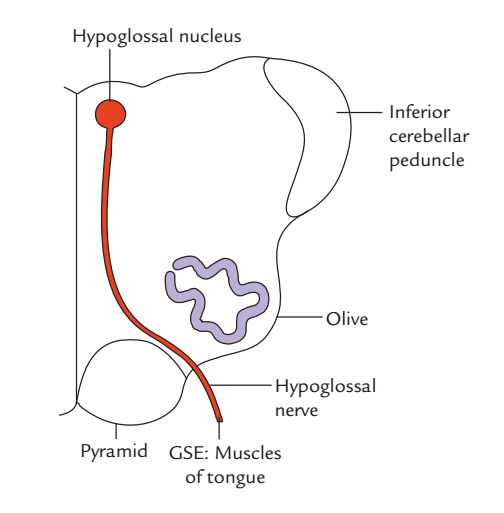 If the hypoglossal nerve of 1 side is damaged, the tongue deviates to the side of the lesion/paralysis. If the hypoglossal nerves of both sides are damaged, the patient cannot protrude his tongue. It is located motionless in mouth causing trouble in language and swallowing. If the hypoglossal nerve is cut on 1 side, there will be lower motor neuron type of paralysis of muscles of the tongue on such side. On requesting the patient to protrude his tongue, the tip of the tongue deviates to the paralyzed side as a result of unopposed action of the muscles of the healthy side. Supranuclear lesions demand corticonuclear fibres (upper motor neuron type of paralysis); along with paralysis of the muscles, there will also be fasciculations in tongue on the affected side and the mucous membrane will reveal wrinkling because of wasting of muscles and their fasciculations.